Subiect:- Admissibility of Nursing Allowance during absence of more than 30 days. 2. The matter has been considered in this Department. lt has been decided that Nursing Allowance will be admissible to Nursing personnel during absence of more than 30 days due to leave, training, tour etc., however, duration of such leave will be restricted to maximum 60 days. 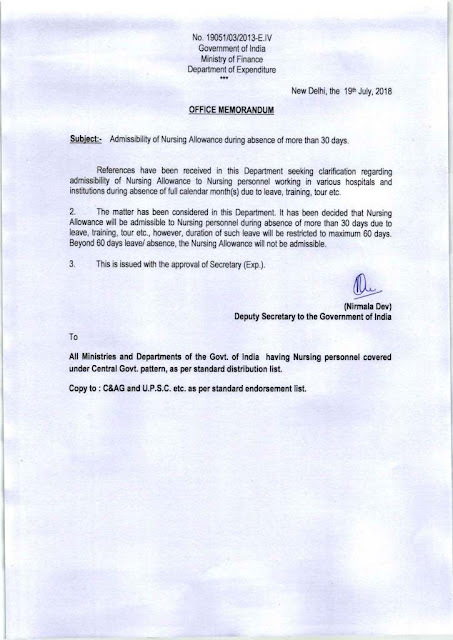 Beyond 60 days leave/ absence, the Nursing Allowance will not be admissible. All Ministries and Departments of the Govt. of India having Nursing personnel covered under Central Govt. pattern, as per standard distribution list.